This Black and Chrome Pillow Stack Table Lamp with Brown Shade is elegant and contemporary. 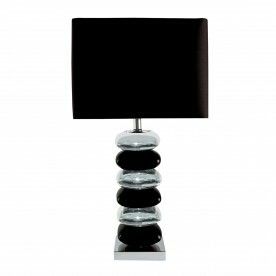 The stand is made up of stacked ceramic pillows in shiny chrome finish and black, with a black square shade at the top. And it looks fabulous in any bedroom, living room or dining room.